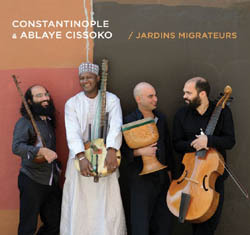 Constantinople, formed in Montreal in 1998, comprises Kiya Tabassian (voice, setar), Pierre-Yves Martel (viola da gamba) and Ziya Tabassian (tombak, percussion). Over the years the ensemble has collaborated with the likes of Frank London, Loren Sklamberg, Savina Yannatou, and many other artists from Mexico, Spain, Italy, Greece, Turkey, Iran, India, China, Mongolia and Uzbekistan. Joining Constantinople here is Senegalese kora player, singer and composer Ablaye Cissoko, who hails from a line of Mandinka griots. 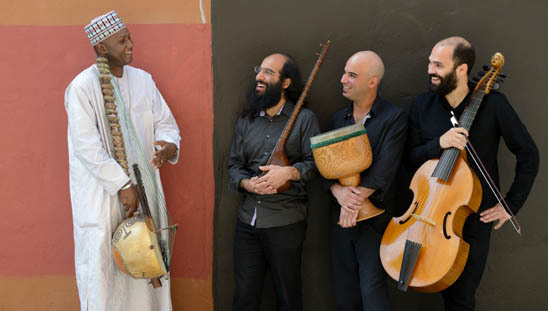 The project's conceptual “itinerant garden” cultivates a spiritual communion wherein Persian strains (the Tabassians were born in Tehran) engage West African and Western classical elements on mutual aural terrain. Viola and percussion underpin the kora, setar and voice, fostering a deferential exchange that conjures sonic beauty through graceful simplicity. The music ranges from the stately medieval (“Traversées”) to the plaintive West African (“A l'ecoute du moro,” “Lountang,” “Soutouro,” “L'aube au sommet”), to the contemporary creation “Before the Rain,” a 3/4 cadence whose genesis and vistas confound received categories.